﻿One of the options to shoot closeup is to add magnification in front of your existing lens. There are lens attachments called closeup filters or positive diopter lenses. They are all the same thing but some are better than others. 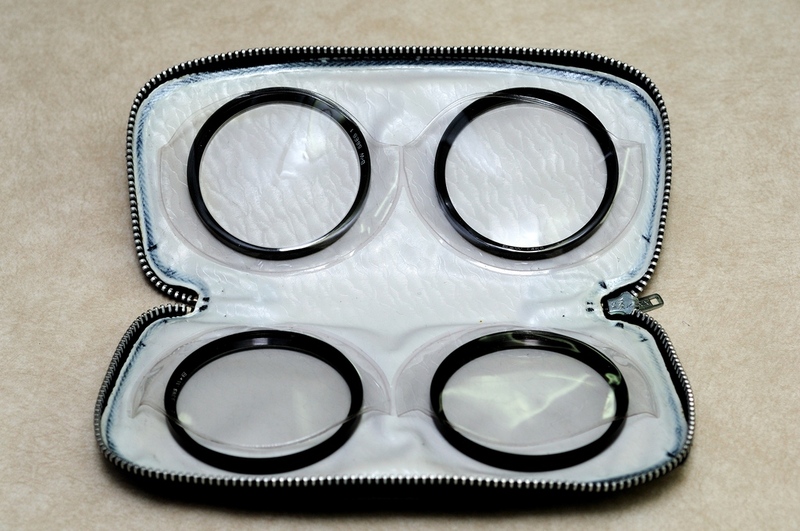 The typical positive diopter lens is sold as part of a kit and often comes with it’s own case. Here’s an example of a set of B+W single element closeup lenses. The kit shown here is a pretty normal item and usually sells for less than $100 for the whole kit. These kits are almost always single element lenses. Each lens is identified by a number which indicates it’s magnifying power. A kit usually has +1 to +4. The lenses can be stacked, that is more than one put on your primary lens at a time. All of the single element lenses will have problems with spherical and chromatic abberations because different colors of light focus at different planes. Better closeup lenses have two elements and are usually referred to as apochromats. The two elements are used to correct the spherical and chromatic abberation and generally do so very well. Because they have two elements, they are thicker and heavier. It’s pretty obvious when you compare the two. A single element lens is no thicker than a filter while the apochromats are twice as thick. The two element lenses may be referred to as doublets by some. Nikon used to make two element apochromat lenses which were designated 3T and 4T in 52mm sizes and 5T and 6T in 62mm sizes, etc. but, these are no longer in production. Nikon also made single element and referred to them as No. 0, No. 1 and No. 2. The lower magnifications didn’t need as much correction as the higher. ﻿﻿The magnification that you will get with these lenses is a function of the focal length of the primary lens. It will be different between a 50mm and a 135mm for example. These are relatively cheap and easy to use. Because they are stackable you can often get just the right magnificaton. I don’t have any examples of the use of these lenses since I moved to digital. I found them fine for occasional use but, my interest in closeup work led me to better options fairly quickly. The set shown was purchased to allow some closeup work with a Mamiya 645 film camera.